A traveling photographer out on an assignment will need to carry most of his photography equipments with him. His professional DSLR bodies, lenses, filters, polarizer, tripods battery packs, chargers, remote triggers, flash gear and even his laptop. To pack all of these together a sturdy, all weather and convenient to carry bag is an absolute necessity. At the same time it needs to pass cabin baggage allowance and be within the maximum allowed dimension for it to fit in most overhead cabin space in modern airlines. 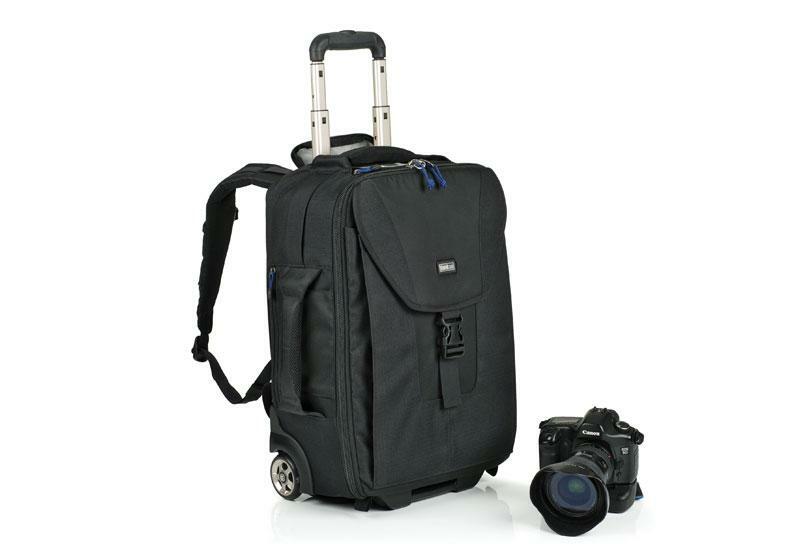 This is where the Airport TakeOff™ Rolling Camera Bag from Think Tank clicks. 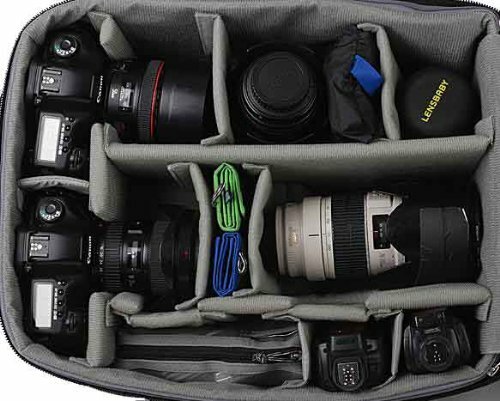 It has sufficient space to carry two professional DSLR bodies. One can choose to or not to attach the lenses with them but there is sufficient space to also carry several lenses of the maximum length of 400mm f/2.8 with lens cap. It can also carry a 15” laptop easily and any of the specified 17” laptops. There are special laptop straps which ensure that the laptop is secured and does not move around when the bag is in motion or being stowed. Convenience of carrying the bag makes it a must have for all photographers carrying their precious photography equipments when Travelling. 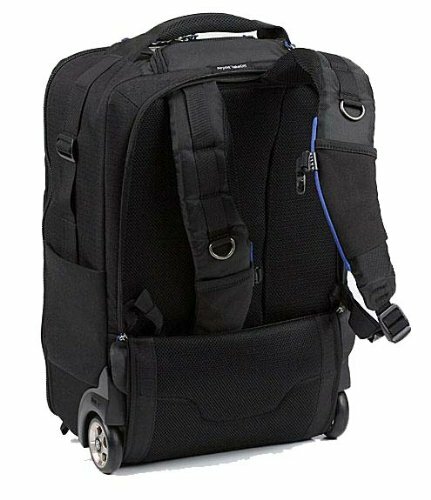 Apart from the collapsible handle which makes the bag easy to pull on its smooth rolling skate wheels, there is an additional set of straps to use the bag as a backpack. They remain invisible safely tucked away till the time when you need them. At that point all you need to do is to open a flap give them a light pull and they are ready to sling on your shoulders. Inside the bag a carefully and well thought out planning has created several compartments to carry the cameras, lenses and other accessories. The rear panel can be opened easily by a zip which reveals a compartment for stacking away the backpack straps. Straps and tripod cup included with the bag allow a tripod to be carried easily on the sides. There is also a cable and lock feature that are inside the clear pocket and underneath the front flap of the bag. 420D velocity nylon (comprising of 3-ply bonded thread) is used to manufacture the body of the bag. DWR is used to treat the exterior fabric resulting in high tensile strength and the underside fabric is treated with PU for extended water resistance while the bag is traveling with you. The zippers used are YKK® RC Fuse which provides maximum protection against abrasion which is a very common factor when the bag is traveling. A sturdier handle is much desirable. Carry straps are sturdy but not comfortable as s dedicated camera back pack of this size and loaded weight. The laptop pocket needs more padding, specially when it is on top. There is no dedicated tripod carrying option. Several other refinements including a 3D air mesh, closed cell foam and polyethylene made dividers for the compartments, in-line skate wheels which are replaceable, PU backed velex liner & dividers makes the bag a joy to use and carry around. A fully functional piece of design that not only ensures that you can keep maximum amount of accessories inside but also keep them safe and make them easy to carry around.